Throughout the summer of 2016, I will be spotlighting a DIY brand that is raising hell, going wild or otherwise “Breaking Bad” in the good ole’ Garden State. 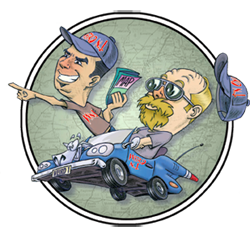 This weekly series will explore the who’s, how’s, why’s and what’s happenin’ behind several of New Jersey’s most unique and interesting DIY brands. Armed with a set of ten questions, I’ll check in on tattoo artists, pomade purveyors, hot sauce hawkers, craft beer brewers, emerging bands, classic barbers, b-movie makers, burlesque dancers, beard growers, music bloggers and record company reps as they as strive to find a release from the typical constraints of normal society and follow their transformation from hopeful upstarts into badass entrepreneurs. 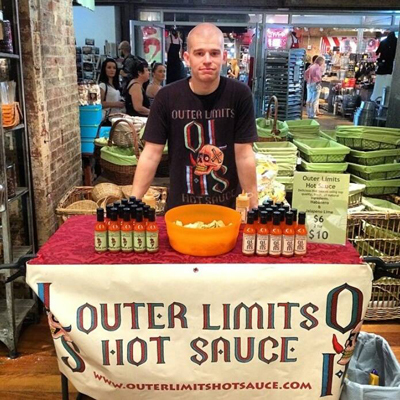 10 Questions for Ed Martin, the creator of OUTER LIMITS HOT SAUCE from Bayonne, NJ. I am flying high over Tupelo, Mississippi with America’s hottest band… and we are all about to die! 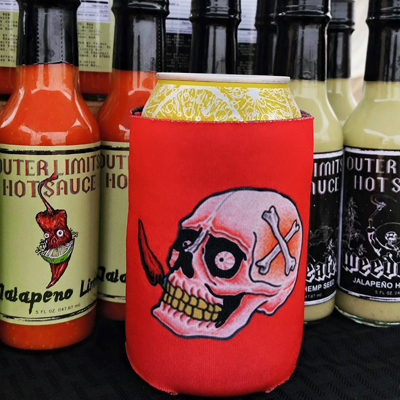 I’m kidding, of course… I am actually standing in a parking lot in central New Jersey, talking with Ed Martin, the mastermind behind Outer Limits Hot Sauce. Ed is organizing cases of hot sauce, boxes of merchandise and display materials in his hatchback vehicle in a manner that is similar to a madman playing his favorite level of Tetris. Everything goes in its right place, no space wasted, and similar to his work ethic, he has a vision to create order out of chaos and push his goods and wares to the (outer) limits. While he loads up, Ed regales me with stories that have me envisioning him driving at breakneck speeds across county lines in search of the perfect pepper. Upon making the ultimate score, he fills his vehicle with crates of his key ingredient and races home as peppers float around him with every bump in the road. I picture Ed as Walter White, a chemist consumed with creating the purest product made from just the right combination of organic substances. I can totally see him in his kitchen, cooking up a test batch of his latest flavor, surrounded by beakers pluming with smoke and walls splattered with hot sauce like a crime scene… And there Ed stands triumphant as he wipes away the tears that comes with both the joy of finding the just the right taste and the pain that comes with getting jalapeño ghost pepper in his eyes. 1. Where did the name, “Outer Limits” come from? ED: We brought the name back from my dad’s ski shop in Middletown, NJ. 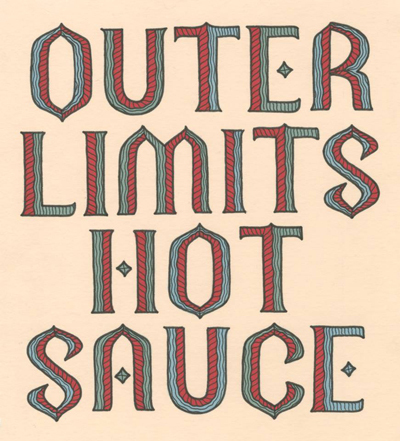 When we were trying to decide what to name the hot sauce we figured that Outer Limits was just as fitting for a hot sauce as it was for a ski shop. When we named the ski shop, we took the name from a trail at Killington in Vermont. 2. Why did you decide to get started and how did you go about it? I’ve been growing peppers with my dad for as long as I can remember. A few years back, Hurricane Irene knocked down a big tree in his backyard which cleared space for us to start growing way more peppers. We started using the peppers to make sauce for ourselves and to share with friends and family. Everyone really enjoyed it and it took off from the here. Eventually we launched a Kickstarter campaign to raise the money we needed to get into a commercial kitchen. 3. I am picturing you as Walter White from “Breaking Bad” (I’m not gonna say if that means picturing you in a hazmat suit or in just an apron and tighty-whities) but what does your process really look like? When we started we were doing all of our cooking at home, but with food (due to regulations and standards), you cannot produce in a home kitchen for the purpose of selling it. So, with the funds raised from the Kickstarter campaign, we have been doing all of our cooking at a commercial kitchen in Reading , PA. The home kitchen is just for test batches now and it is a pretty comical sight. The pot I use to cook home test batches is so big that it barely fits on the stove and the blender I use looks like a boat propeller. My wife can typically smell when I’m experimenting by the time she gets off the train… which is a few blocks from our apartment. I currently live in Bayonne, NJ and we have really been embraced here and in the surrounding re of Jersey City. There is an incredible Makers community in Jersey City and we have been lucky to collaborate with a number of those companies. Currently, Grandma Downtown uses our Habanero Hot Sauce in her Spicy Pulled Chicken Rolls which are always a hit at events. In the past, a local popsicle company, Peace.Love.Pops had used both our Habanero and Jalapeno Lime sauces in some of their popsicle flavors. 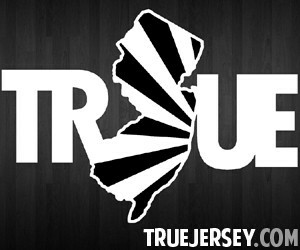 I’m originally from down in Monmouth County and we are lucky to have a great following there as well. We are sold at both Sickles and Delicious Orchards, two stores that I frequented growing up in that area. It’s very cool to see my products on the shelves of stores I have shopped at my whole life. Additionally, the Asbury Park scene has been great to us, from the amazing markets like the Asbury Park Bazaar and Asbury Fresh to the local music scene. We have great friends in the bands, The Battery Electric and Hot Blood, and they have been nice enough to let us come out to their shows and set up the hot sauce table next to their merch. We even did a limited edition labels on our sauces and chocolate bars for The Battery Electric when they released their album The Heart and The Thrill. 5. Does being part of an online community make it difficult to “please the people” and still “stay true” to your vision? It’s great that people are excited and you want to please them, but I’m not in the business of recreating someone else’s sauce because people love it. My first question is always “Do I like it?” And if I do then there is a good chance other people will too. 6. What phase of the love/hate relationship would describe your current state of mind when dealing with the online community? C’mon you can tell me! I very much love all of our online followers. We have an extremely enthusiastic following online and with Instagram in particular. We’re lucky in that the negatives are overwhelmingly outweighed by the positives. With my background being in the music business and running social media accounts for some huge bands, I have a lot of experience with tuning out the negative noise on there. We try to always engage with our customers and keep that relationship going. We also love to offer contests as a thanks for their continued support. We just hit 6,000 followers on Instagram and are hosting a huge giveaway with some of our other favorite companies to thank our followers for helping to grow our business and our community. 7. Your brand has taking you to many places, not only in the Garden State but also around the United States? What is one of your favorite adventures or experiences? Any least favorite experiences? One of my favorite things that we do outside of NJ is going up to SPAC in Saratoga Springs, NY to set up the hot sauce tent at Phish shows and Dead shows. When we first started the company and were cooking at home, we would bring up bottles and give out samples before the show to try and gauge the interest of people that didn’t actually know us. The community atmosphere there is amazing and we have a number of customers up there that have been supporting us since day one. We’ve been lucky to not really have any particularly negative experiences so far. I’d say my least favorite thing we’ve run into is just getting bad weather at an outdoor event. There have definitely been some days that ended up being sitting in the tent for 6 hours with rain blowing in sideways to sell 4 or 5 bottles of sauce all day. But that’s just part of running this kind of business that relies so heavily on outdoor markets. 8. What should we know about what you have got going on? We are currently hard at work cooking up test batches of new sauce flavors and we’re also getting things together to start releasing some spice blends. 9. 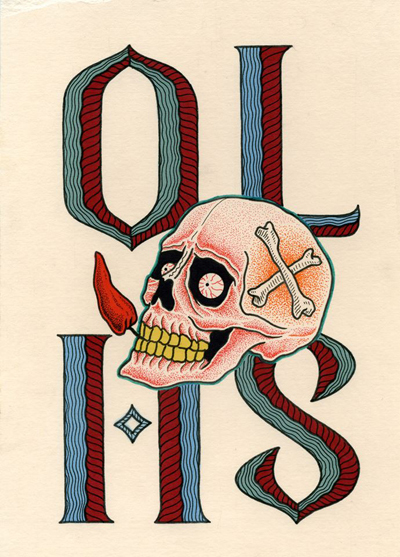 What can we look forward to in the future from OuterLimits Hot Sauce? Later this summer, probably late August /early September, we’ll be releasing our newest flavor Ghost Pepper and Roasted Garlic. It will be by far our hottest sauce and it is some of my favorite label art we have put together yet! 10. Where can folks find you to keep up with you? 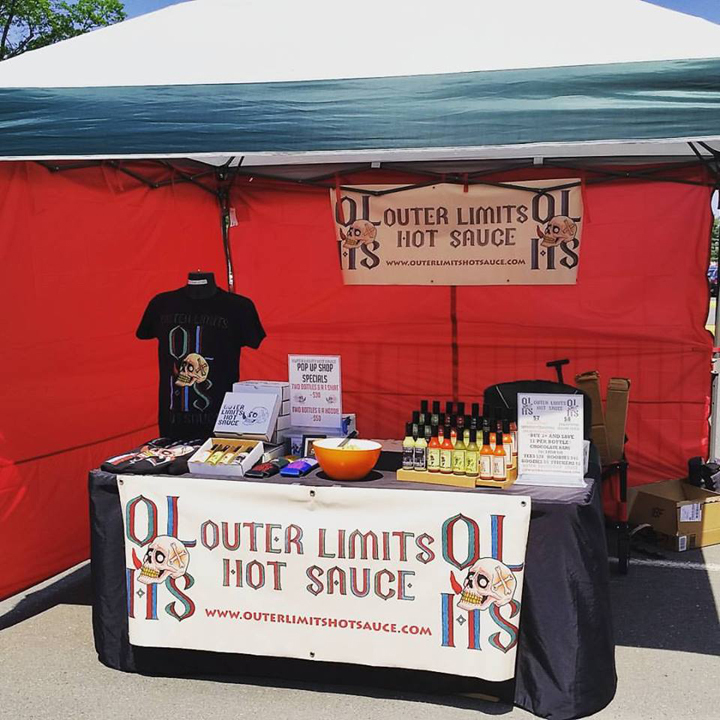 You can keep up with us online on Facebook, Twitter, Instagram and OuterLimitsHotSauce.com. We keep a list of all the stores we’re in on there as well as our next few events coming up. Some events that we’re most looking forward to would be Bradley Beach LobsterFest, Asbury Park Oysterfest, Red Bank Oysterfest and both the Trenton and Philly Punk Rock Flea Markets. Thanks for the info and the time, Mr. Martin! 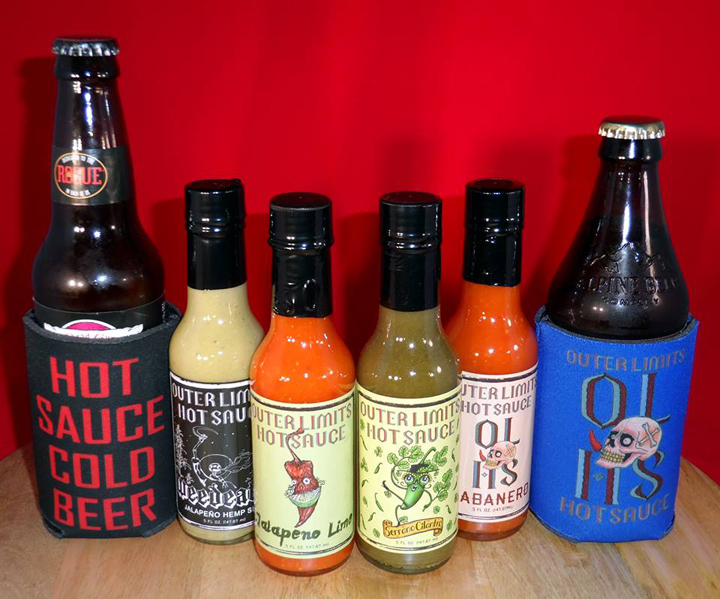 I’m definitely looking forward to turning up the heat this summer with Outer Limits Hot Sauce! 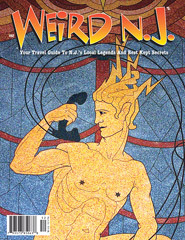 Annnnd to our faithful readers, Stay Up, Stay Tuned and Tune In Next Time as WEIRDNJ “Breaks B-Movies ” with The King of B-Movies, Bill Zebub of Clifton, NJ. This entry was posted in D.I.Y. N.J. and tagged Asbury Park, bayonne, d.i.y., hot sauce, matt chrystal, Outer limits. Bookmark the permalink.